I always heard there is no harder job than being a mom, but not until I had my own kids did I understand what that really meant. Being a mother is all consuming. Weelicious may be my passion and creative outlet, but being a mom is my real job. No matter whether they work full time, part time or not at all, that's true for most mothers I know. From the second you wake up until the time you go to bed (and possibly several times during the night if you've been in my house the past 4 1/2 years), your work never ends. It's all at once exhausting, exhilarating, empowering, frustrating and most of all, a magical experience. And within my "job" there never seems to be enough time to do the things I need to do (if I am lucky these days I make it to the dry cleaner once every 2 months). Sometimes it feels like I have to move mountains to carve out 20-30 minutes of my day just to get a meal on the table for that night. 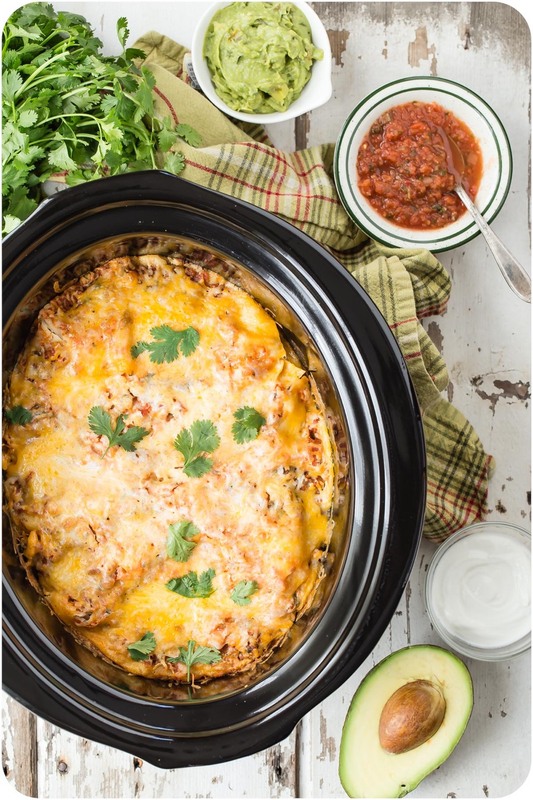 Mornings can be so busy for me that I've started doing a good bit of crock pot cooking midday before school pick up, so having a one pot meal like this Crock Pot Mexican Tortilla Lasagna is perfect for my schedule. 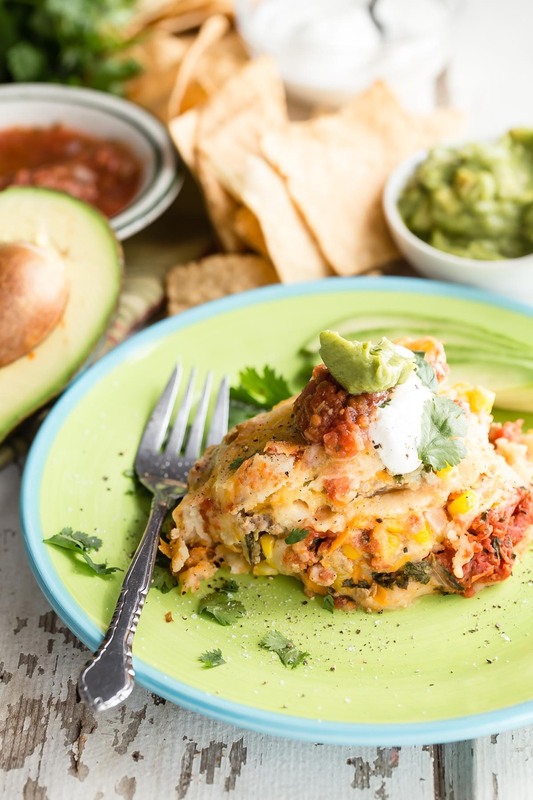 Layered with tortillas instead of lasagna noodles and packed with tons of veggies, salsa and cheese, this is a delicious meal that's great when you want utter convenience and a dinner that is unique and special. Just toss in all of your ingredients, turn your crock pot on and come home a few hours later to a finished meal that will make the hardest job in the world look easy! 2. Add the ground turkey meat, cumin, salt and chili powder and cook for 6-7 minutes until cooked through. Place turkey mixture aside and cool. 3. In a large bowl, whisk the egg and sour cream together. Add the cooled turkey mixture, carrots, corn and cilantro and mix to combine. 4. Spread a 1 cup of salsa on the bottom of the crock pot. 5. Layer 5 tortillas on top of the salsa, cutting them if necessary to fit the crock pot and covering the salsa completely. 6. Place half the turkey mixture on top of the tortillas and top with 1 cups of salsa and 1/2 cup of cheese. 7. Add another layer of 3 tortillas on top of the cheese. Pour the remaining turkey mixture on top of the tortillas and top with another 1/2 cup of cheese. 8. Top the lasagna with another layer of tortillas, pour the remaining salsa on top and cover with 1 cup of cheese. 9. Cook on low for 2 1/2 hours. Yummy this looks so great!!! Thank u for the recipe!!! This sounds sooo good. Some questions, though. My son was recently diagnised with a egg allergy. If I left the egg out of this recipe, would it be okay, flavor-wise? I guess the egg is just a binding agent, correct? I am not concerned if the outcome is \"crumbly\". Also, I assume the tortillas are not an absolute must either? This is more for my husband, who is trying to lower carbs, as much as possible! I was thinking I could just spoon it on some shredded lettuce for a version of taco salad? I'd love to find out if this can be made without eggs as well. If anybody tries it, please share the results. Thanks! Meghan- I use an egg substitute pretty frequently (my brother is vegan) and have never had a problem in a made-from-scratch recipe. The one I use is Ener-G Egg Replacer. My son is also allergic to eggs, but it's \"raw\" egg. He can eat anything that has cooked eggs. Check with your doctor? 1. Is kosher salt different than regular table salt? 2. If I bake this in the oven instead of cooking it in the crock how long should it be baked and at what temperature? 3. Do you have a recipe for salsa? I'm not a fan of jarred salsa. I find it to be too salty. Yes, kosher salt is different. I like to use it in place of table salt. The grains are a bit larger and it doesn't have such an iodized taste. It's not expensive and all groceries carry it. This looks delish! and soooo true about being a Mom. It is the hardest and best job I've ever had! And Avocado for the top! Do you think whole wheat or spelt tortillas etc. would work?? I think spelt of flour would totally work, but there's something about the corn tortillas that's so good! I can't wait to make this later on in the week! Quick question...hubby's not a fan of corn tortillas, do you think ww flour tortillas would hold up? The flour tortillas will hold up great! This looks fantastic. Thank you so much for the great idea! I have to try this. I have a wheat allergy. I don't have to avoid all gluten, but have to cut down on wheat, and it always seems that recipes like this call for flour tortillas. Glad to see one with corn tortillas. Could this be made in the crock pot the night before, refrigerated, brought to room temp and turned on a couple hours before dinner time? I'm a full-time (I own my own design agency), work-at-home mom of a 2 year old so I'm always looking for quick meal ideas. I'm going to look into this one for sure. This sounds wonderful, and I love cooking with my crockpot! I'm not sure how big your crockpot is - are you layering 5 tortillas directly on top of each other in one REALLY thick layer (like in a small crockpot), or are they spread out to make one single layer (in a large crockpot)? I hope that question is clear! Thanks! Thank-you, Catherine for this excellent recipe!! My two boys devoured it. 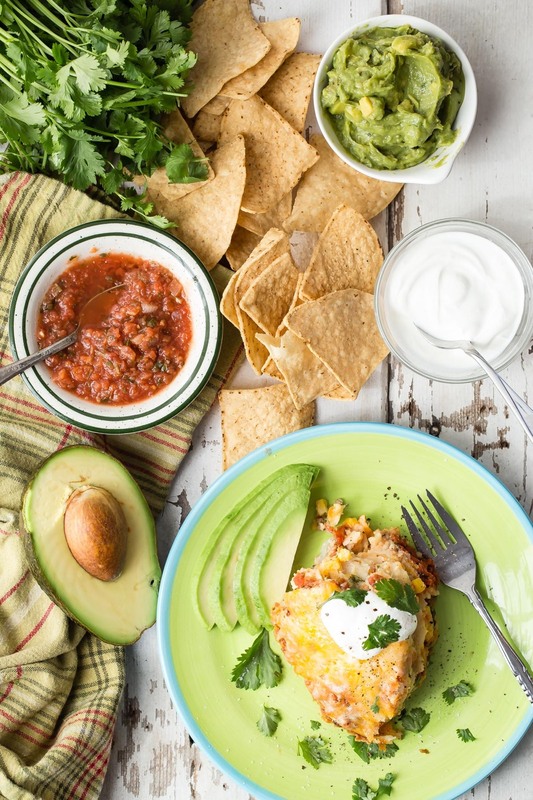 \"It's like nachos!\" my seven-year old exclaimed, and \"I just got a bite with cilantro!\" My five year old helped me to make it. He loved grating the cheese and measuring the spices. He ate two helpings, which I was surprised at being that he usually doesn't like salsa. It made such a difference at the end of a long day to have such a delicious dinner ready to go. I used ground beef because that's what I had on hand and it was very tasty. This will definitely become a part of my regular meal plan. I would love more slow-cooker recipes. Thanks again. What size crock pot did you use? I have a 6 quart (just bought it) and I'm finding most recipes are for 4 quart. It seems to me the 4 quart recipes cook faster in the 6 quart. Thanks for the help. I was wondering what size crock pot you used too. Made this yesterday! With my own business and a newborn and a toddler, this was PERFECT! Only took 30 minutes and made it right after lunch. Added chopped mushrooms to give it an extra boost of veggies. It was so gratifying and relaxing knowing dinner was ready at night. 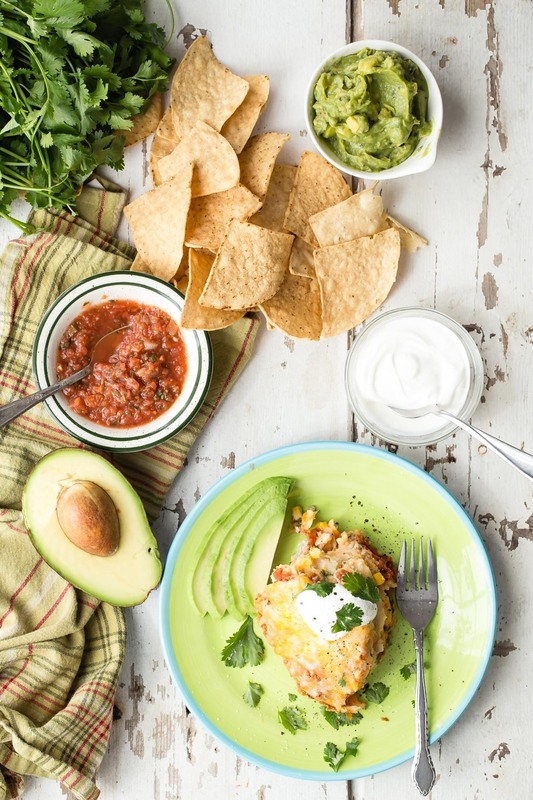 Love weelicious recipes and love crock pot - more please! This sounds amazing. My husband doesn't like anything with tomatoes. Any suggestions for switching the salasa with something else?? Made this tonight....very good! My only suggestion would be to cook it slightly longer. The very middle of mine was only warm...the sides and bottom were piping hot but it could have cooked just another 30 minutes or so. made this last night, loved all the flavors. and it was super easy to make! however, I felt like my corn tortilla's did not hold up really well and simply disolved... I wonder what to use next time? Maybe hard shell tacos? This was so incredibly good! The fresh cilantro really made it. I didn't have time for the crock pot, so did it at 350 in the oven until it bubbled. This was great. I used Boca crumbles instead of turkey and we didn't have corn on hand so I used edamame. Everyone loved it! This is a good recipe, but it was way too spicy for my 6 year old and 2 year old, they took one bite of it and pushed it away. I will definitely make this again, but 1/2 teaspoon of chili powder was too much for my kids - next time I will do 1/4 teaspoon or just a small can of chopped mild chiles next time. Any changes necessary when using a 8 quart slow cooker? This was awesome! Had a really fun time making it with my 2.5 year old. I remember asking you about Slow cooker recipes a year ago and I'm so glad to see even more. I used a piece of Alaskan black cod filet one of our favorites I know it can be hard to find aornud here, though, so something like halibut or another firm white fish would be a good substitute. I made this last night substituting corn tortillas for whole wheat. It was delicious, thank you. This is looking AWESOME!!!! Can't wait to try it! This was delicious, thank you! I substituted black beans for the turkey and left out cilantro (not a fan). I sprinkled the top layer with sliced black olives. Served it with freshly chopped chives, guacamole and pico. Yum! Made this yesterday and it is delicious. A bit too spicy for my 16 month old, but he does like it. I used lean ground beef, added more corn and less carrots (just what I had available). Served with a dollop of sour cream and guacamole and the men fell in love. Cilantro really enhances the dish, but next time I'll cut back on the spiciness and add black olives! Thanks for a great crock pot recipe! Made this tonight &amp; it was so yummy! I think my crock pot must be smaller than yours as it wasn't hot at 2.5 hours (it's a taller one). It was a bit more work than I'm used to for a crock pot recipe but definitely worth it! This was a hit...made it tonight. My 2 year old had seconds. Thx Catherine for all the great recipes!! Do you have any nutritional information like the Calories/Fat? If you cook on high instead of low, will it cook faster? New to the crock pot world...why cook on high vs low? With this sort of recipe it is better to cook on low so that the entire lasagna has a chance to get cooked and warmed through. If you did it on high the outside and edges would burn and/or become rubbery and the inside would stay colder and not cook as evenly. Full of flavor!! I was expecting this to be heavy and was so happy that it was surprisingly light. Even happier that this was a crowd pleaser-husband and son loved it as well. As always I added one more clove of garlic because I just can't help myself!! Made this last week and it was fantastic. The only way my 13 month old will eat meat! I made this for a work potluck, and people couldn't stop talking about it! It was dubbed the best dish of the event, and certainly made me feel like a star! Thanks for such a great (and simple!) recipe! Made this last night for dinner. My husband and my 2 year old both gobbled it up. I used the mild chunky salsa from Trader Joes. Family loved it!!! Thanks!! Spicy factor definitely in the salsa so be sure you pick one with a heat level the whole family has been able to tolerate. I had only partial jar salsa so I combined with a can of diced tom plus green chiles and that sent the heat too high for my little one. Does this freeze well? If so, what is the best way to defrost? I'm not sure this would freeze well. I'd say skip the freezer on this one, because I don't think the cooked tortillas would hold up after being frozen and defrosted! The best thing to do for a lasagna is to assemble it and freeze before baking! Then defrost in the fridge before baking, or if you have it in a freezer to oven baking dish then put it straight into the oven and add about 10 minutes to the baking time! You must be a wizard or something. My kids won't eat anything, but anytime I make a recipe from this site they gobble it up. I didn't have time do this in a Crock-pot so I used my dutch oven instead and baked it for about 40 minutes. It still came out awesome and my son thinks I'm cool (!) for making a \"cake out of tacos\". Do you think this would work with flour tortillas instead of corn? That is what I have on hand and usually prefer, but not sure if the texture will throw it off. Hmm those might get mushy. If they're a thicker tortilla that would work better! Making this for the 2nd time. It is so quick and so satisfying. Great recipe!! Made this today and loved it!! This was a great recipe....being gluten free was key. Terrific flavor and not too spicy (I used the Trader Joe's chunky mild salsa) my crockpot is the standard size, not the larger oval crockpot. Based on the reviews that I read, I cooked it an additional 15 minutes. Definitely will make again. do you think black beans would work in place of the meat--we're vegetarian. thanks so much! 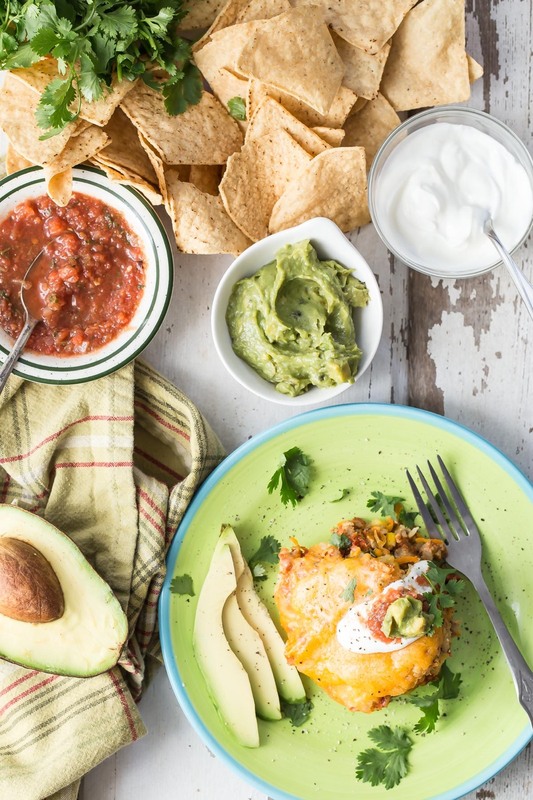 You've probably already tried this, but I made this with black beans and it was deeeelicious! Surely understand you. Lately all the great deals seem to be so far away lol. Sedano's had milk a bit less, and it seems we have been saivng a bit there as well. Yum! My whole family loved this. I made a few minor changes due to what I had on hand and I baked it in the oven in b/c I wasn't going to be home to turn the crockpot on at the right time. I used chicken instead of turkey. It was quick to throw together the night before then I baked it at 350 for about 40 minutes. My kids all had multiple helpings and my hubby said 'definitely keep this in the rotation.' :) Love those kinds of reactions to dinner (and as all moms know, they don't happen all that often hehe). Thanks, Catherine! Love everything you do!